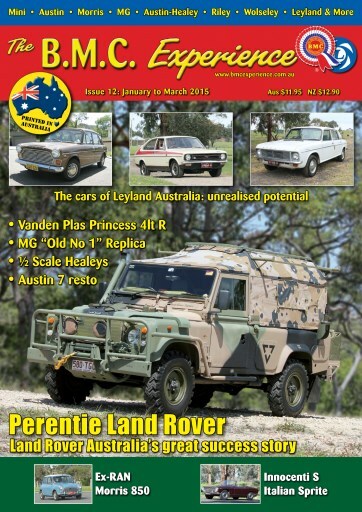 This issue we take a look at the cars of Leyland Australia in the early 1970s and what really went wrong with them. To balance that we have Land Rover Australia's great success story, the Project Perentie Land Rovers. There is also a 1963 Mini that was originally owned by the Royal Australian Naval College, HMAS Creswell; the story of the Innocenti S - the Italian version of the Austin-Healey Sprite; a Vanden Plas Princess 4lt R; replica of MG's "Old Numer 1"; quarter-scale Austin-Healeys; an Austin 7 restoration and loads more.